Given the sizes of the boxes, the smaller one can be easily fit into the medium-sized one and the latter can be placed into the bigger one, proving to be very efficient when it comes to moving them around or taking them with you during one of your travels. In addition, the outer box comes equipped with a beautiful handle, so as to make your transporting far easier. 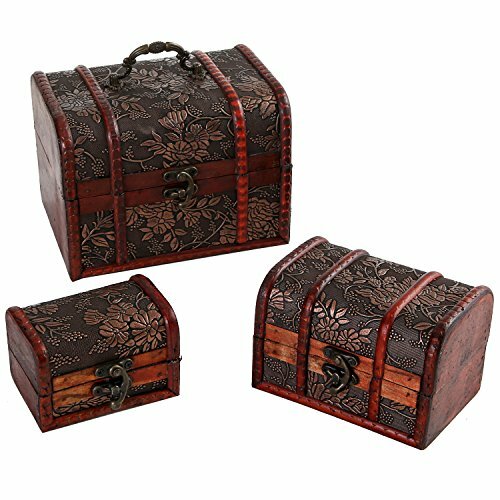 All boxes are a gorgeous and rich burgundy color and they are beautifully carved with flowers and grave-vines patterns. 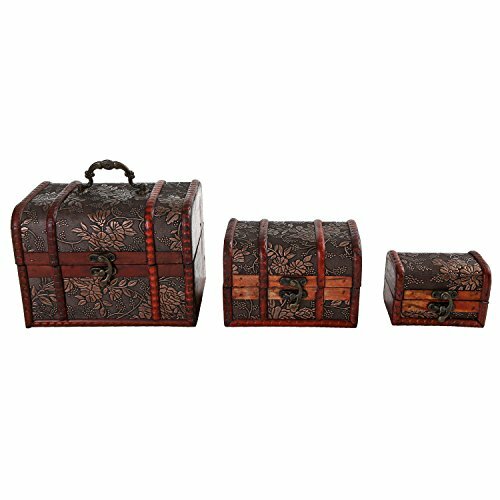 Delightful and elegant, this set of three storage boxes is definitely a highly convenient, stylish and proficient purchase! All of these boxes are sculpted out of premium wood, very resilient and sturdy. 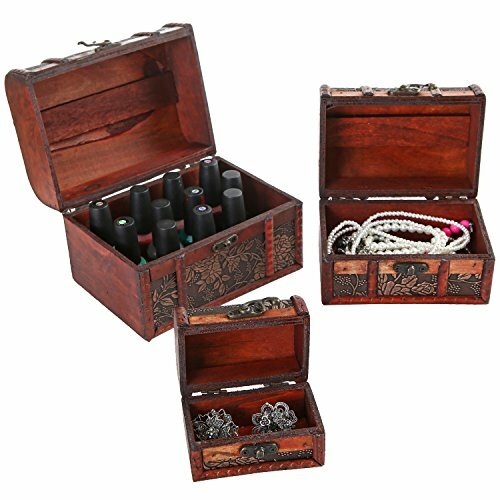 The sizes are conveniently thought, so that you can use the big box for the storing of your make-up or larger possessions, the middle one, for your bigger pieces of jewelry, such as pendants and bracelets, and the small box can be used for the depositing of your rings and earrings. All three of them have a curved handle edged onto one side, in order to make the locking of the lid more secure. A genuine and clever piece of craftsmanship, these boxes are sure to be an ideal gift to anyone! The dimensions of the boxes are: the outer box – 7 W X 5 H X 5 D inches; the middle box – 5 W X 3.25 H X 3.25 D inches; and the inner box – 3.25 W X 2.25 H X 2.25 D inches. Per total, their weight is 10.1 ounces. 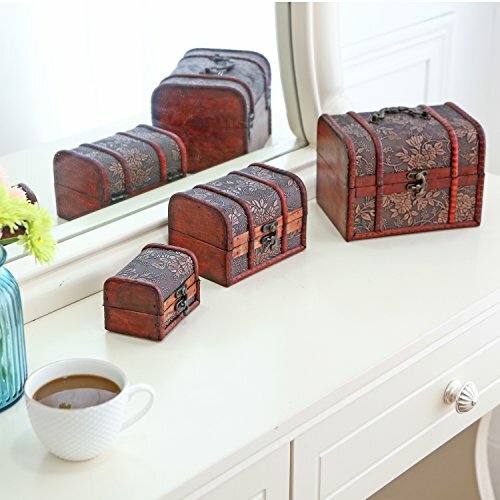 Approximate Dimensions (in inches): Outer Box – 7 W X 5 H X 5 D; Middle Box – 5 W X 3.25 H X 3.25 D; Inner Box – 3.25 W X 2.25 H X 2.25 D.
A charming set of 3 nesting boxes, each one made of wood and featuring an antique trunk shape and an ornate exterior design. The smaller boxes fit into the larger boxes in a nesting design that provides for convenient storage. Ideal for storing a variety of small items on any desk, counter, dresser, or tabletop.